Damascus has sent a letter to the United Nations accusing some Lebanese areas of helping al Qaeda and the Muslim Brotherhood to take root along the Syrian border, adding to its criticism of Turkey and Libya for allegedly providing arms to Syrian rebels. “Some Lebanese areas next to the Syrian border are incubating terrorist elements from al Qaeda and the Muslim Brotherhood, who are messing with the security of Syrian citizens and work on undermining the United Nations Special Envoy’s plan,” Syrian U.N. Ambassador Bashar Ja’afari wrote. The letter, which was sent to U.N. Secretary-General Ban Ki-moon and the Security Council, was delivered on Thursday and obtained by Reuters on Friday. “In some areas (of Lebanon) … warehouses have been set up for weapons and ammunition that is arriving to Lebanon illegally, either by sea, or sometimes through using the planes of specific countries to transport weapons to Lebanon and then smuggle them to Syria, under the excuse that they (aircraft) are carrying humanitarian aid for Syrian refugees,” Ja’afari said. He specifically said charities run by Lebanese Salafists and the Future Movement, led by the son of assassinated statesman Rafik al-Hariri, were being used to provide safe haven to terrorists in Lebanon. Lebanon has had a complicated relationship with Syria, which continues to exercise some influence over its neighbor despite the 2005 departure of thousands of Syrian troops and intelligence operatives from Lebanese soil. Last week Ja’afari accused Turkey and Libya arming Syria’s opposition, which forces loyal to President Bashar al-Assad have tried unsuccessfully for 14 months to crush, killing over 10,000 people in the process, according to the United Nations. “The case of the ship Lutfullah 2, which was intercepted by the Lebanese Army, proves that Libya and Turkey are cooperating with other States to send murderous weapons to terrorist groups, in order to wreak more carnage and destruction,” he said in a letter to Ban and the Security Council last week. Lebanese authorities said that they seized a large consignment of Libyan weapons, including rocket-propelled grenades and heavy caliber ammunition, from the ship, which it intercepted in the Mediterranean. Turkey reacted this week with a vehement denial. “Turkey strongly rejects the unfounded allegations,” Turkish Ambassador Ertugrul Apakan said in a response to Ban and the council. In comments that appeared to bolster Syria’s complaints about foreign militants, Secretary-General Ban told a youth event at U.N. headquarters in New York on Thursday he believed al Qaeda was responsible for two suicide car bombs that killed at least 55 people in Syria last week. But on Friday Ban’s spokesman Martin Nesirky said there was no hard evidence to suggest al Qaeda carried out the attack. “The Damascus attacks were clearly carried out by a group with organization and intent. Some of the attacks we’ve seen clearly bear some terrorist hallmarks with which we’re familiar from elsewhere,” he said. Damascus has maintained all along that it is facing a “terrorist” conspiracy funded and directed from abroad, not least by resource-rich Gulf monarchies Saudi Arabia and Qatar, which have called for arming the fighters aiming to oust Assad. Syria earlier this month sent the United Nations the names of 26 foreign nationals it said had been apprehended after coming to fight in Syria. It described 20 of those as members of al Qaeda who had entered the country from Turkey. Forces loyal to Assad shot two protesters in the capital Damascus on Friday and fired in the air to break up thousands of anti-government demonstrators in the commercial hub of Aleppo, opposition activists said. MP Ahmad Fatfat, a member of the Future Movement bloc which is headed by former PM Saad Hariri said on Saturday that Foreign Affairs Minister Adnan Mansour should summon Syrian Ambassador to Lebanon Ali Abdel Karim Ali to inquire about the letter sent by the Syrian Foreign Ministry to UN the UN chief. 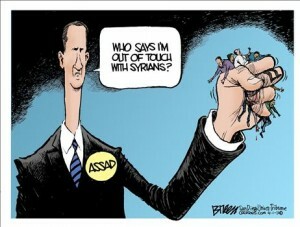 “We are waiting for Mansour to summon the Syrian envoy,” Fatfat told LBC television. “ Its statements are lies and proof of the Syrian regime’s political bankruptcy,” Fatfat added. The Lebanese government is currently dominated by Hezbollah which supports the Syrian regime in its brutal crackdown against the pro democracy protesters. Minister Fayez Ghosn who was the first to announce the presence of al Qaeda in Lebanon( despite strong denials by Interior Minister Marwan Charbel) is a member of the Marada movement which is headed by MP Suleiman Franjiyeh , a close ally of Hezbollah and president Assad. According to media reports Ghosn has been collaborating with the Syrian regime by trying to help it prove its its claim that it is fighting terrorists. Charbel said Wednesday that there are individuals in Lebanon who sympathize with Al-Qaeda, but that the group as an organization does not exist in the country, does not have any bases and does not receive any funding. “Al-Qaida doesn’t exist in Lebanon but there are people who support it. It doesn’t have a training base in the country nor does it receive funding ”Charbel told reporters in a news conference in Tripoli following the North Lebanon Security Council’s meeting at the Serail. There are many who ignore real facts that exist on the ground and talk about those that they want people to believe!! Mostly because facts are reported inaccurately, or too little information comes out, or it’s simply not allowed to be printed at all. And much of what does is biased.